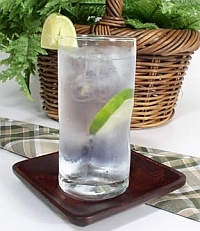 Pour the gin and the tonic water into a highball glass almost filled with ice cubes. Stir well. Garnish with the lime wedge. As an option, squeeze lime juice into the drink. This original gin and tonic actually has an interesting history. It was originally introduced by the army of the British East India Company in India in the early 19th century. The British soldiers and colonists got down to India and realized there were bugs there. Specifically, malaria-toting mosquitoes. Quinine was an effective treatment for the disease, but its bitter taste made it unpalatable. So, they did what any sensible person would do: added booze. Nowadays, tonic water has much less quinine, so it’s less bitter… Enjoy your lovely gin and tonic (or vodka tonic, if you wish).